If you walked into my home this month, you'd stumble on boxes. A box at the door, two boxes in front of my closet, boxes, boxes, boxes. I'm continuing to declutter --- deciding what stays and what goes --- but old stuff has to go somewhere, right? And I don't want that somewhere to be places that don't need or want my stuff. That would be a waste and with the environment the way it is, I don't want to add to that problem. So what am I doing with the things I no longer want? I do this for most brand-name things. I take photos, list them online, find buyers, and ship them. I've also joined garage sales in the past but I find online selling is easier for me to do. Why make all that effort vs. giving them away? Anything spent on something you and I already own is a sunk cost. We can't get it back most times as secondhand items lose their monetary value quickly. With that said, money's money. Even if we almost never can get back what we spent, making some money from old stuff is still worth doing when those things have good resale value. Someone will keep using my stuff. I have gotten rid of things through the years by dropping them off with whoever and wherever will take them. But when you and I are not careful about where our old things go, that often means they still end up in a landfill --- just in a roundabout way. With all the perfectly useful things that are already there, I'm not ok with that. When I sell things, it often means whoever bought them will use them. And that's a better alternative. Tip: Want to sell stuff online but don't know how to start? The Luxe Strategist has a great guide on How To Sell On eBay Better Than Anyone Else that's helpful even if you're planning to sell your items on other sites. Another option is sending stuff to charities with causes you and I believe in. I usually do this for things that are like new or gently used, but don't necessarily have a high resale value. It's also best to make sure the charities you and I give to could actually use those items. Some charities specify exactly what they need (linens, canned goods, etc.) so send them items they'd find helpful. Tip: Unsure about how legit a charity is? Check out their ratings on watchdogs like Charity Navigator. You can also check online for more info on charities you're curious about, or call around your neighborhood or church to see what people you know recommend. I give to friends and family. I touch on this a bit when I talk about how to get unstuck when clutter's overwhelming, but occasionally, we have things we no longer want that other people around us do. Like how my sister gifted me old clothes that I now wear often. Or how my old camera became my cousin's new favorite for day trips. Like with charities, there's also the fine line where we end up gifting our friends and family things they don't want. But some of our stuff can make the people around us happy. Tip: Have a swap party with friends! Just pool your old stuff together, have some snacks and music, and make a fun night of swapping items with people who would enjoy taking those things home. You can also do what I did: letting friends help me declutter in exchange for things they want out of the "give" pile (+ dinner, my treat!). I repurpose and use it up. Our Next Life's Use It Up challenge last year resonated with me. They committed to - you guessed it - using up and repurposing things they'd otherwise get rid of for a year. Because as much as it stings, our donations and recycled things often end up as trash even with our good intentions. Plus, since we're all about down-to-earth minimalism here, I want to be practical too! Throwing out my old stuff when it isn't worn out is the opposite of that. Shampoo from almost-empty bottles in my bathroom has become soap to clean my brushes. The Doc Martens of my university days are being worn everyday this winter instead of buying new waterproof boots. Dishes for parties I never use in the kitchen (because I never throw parties at home, go figure) have become trays for my perfume and jewelry in the bedroom. Used paper has been tied together into makeshift notepads so I can write on the opposite side too. Don't get me wrong, friends; I still believe in minimalism and decluttering. I just don't believe in wasting stuff. Whatever I can't find a home for somewhere else gets repurposed and used up instead of just throwing it out. So that's where all my old stuff is going, friends! I continue to declutter and tackle my hoarding habit, but I'm also more mindful of how I get rid of things. 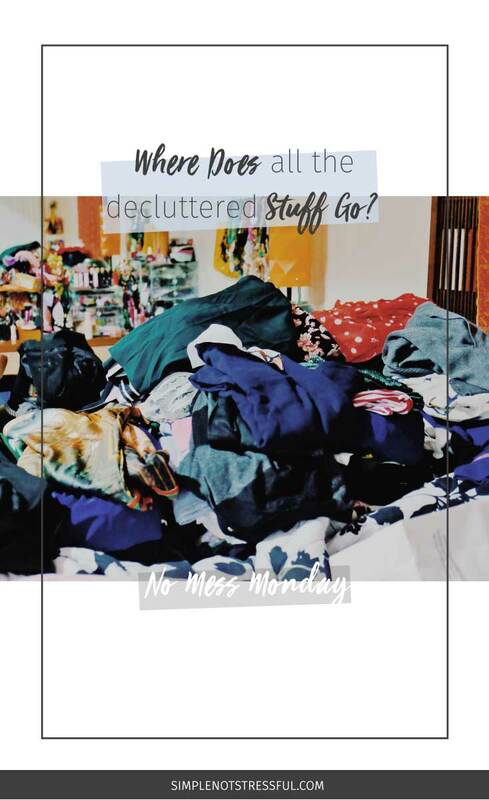 Curious about how the rest of my decluttering journey is going to go? Sign up as an email friend: you'll get extra photos from my hoarding, tips, and other good stuff in your inbox twice a month (read: when a new post goes up). Just click the button below to get in on the goodness.